The American dollar is a beleaguered currency. Perhaps not so much as the ruble or the peso, but it has seen better days. I remember those days. 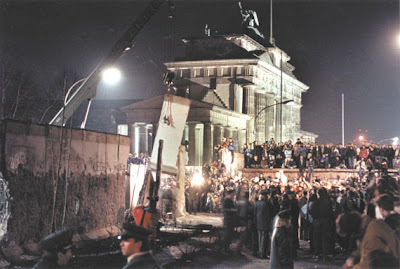 In fact, they were not so long ago. It happened rather suddenly. For years all we could get a hold of were paper dollar bills. Then, out of nowhere the US treasury started pumping out really awesome coinage. The most exciting and glorified version of the dollar was the gold coin graced with the beloved image of Sacajawea, my secret love from another life. Sacajawea was a wonderfully helpful and strong American Indian woman who was kidnapped at a young age from her tribe and became the wife of a French trapper from the Dakotas. 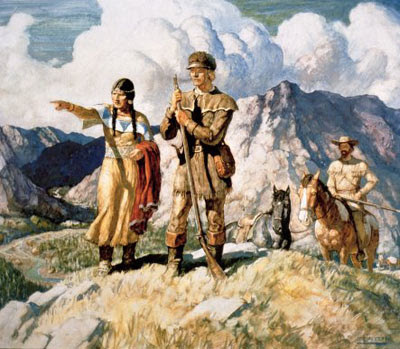 She later helped Lewis and Clark on their trek west, suggesting routes and serving as a welcoming and peaceful symbol to those the party met along the way (because a party with a woman could not be a war party). But, to me she is more than that. Sacajawea is an enchantress to me. Her name alone is reason enough to like her. While the scholarly accepted spelling is 'Sacagawea', her original tribe insists that the pronunciation is closer to the Sacajawea spelling, with the soft 'tz' or 'j' sound instead of the 'g'. But either way it rolls off the tongue like a freshly poured handful of skittles. 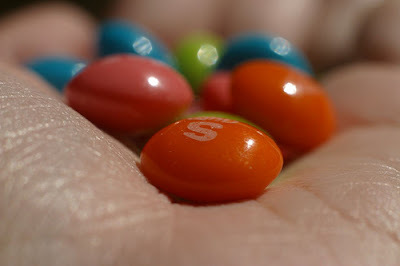 She's like a delicious skittle. Hmmm. Sacajawea. I might just name one of my kids after her. She also is very fashionable. She is wearing exquisite attire (probably handmade by herself) on the coin. She also has nicely groomed hair, meticulously braided. And, on top of all that she's carrying her child showing her more nurturing, motherly side. Put that together with her guide duties and her ability to make delicious food, and you can see why she is an enchantress. But, the mint did us no favors. They made the coin out of the shiniest metal around. 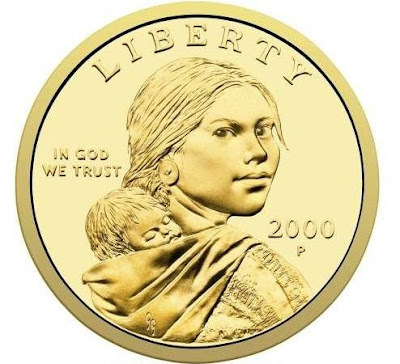 So not only can someone looking at it become entranced by Sacajawea's ravishingly good looks and spend hours reciting her skittle-filled name, but the gold makes it her more appealing. And, for those who like shiny things it could be a death sentence. My advice is to enjoy it, but be careful. Make sure you have a friend handy waiting to backhand you if you start to go loopy. It is an age old question. A tale as old as time. A song as old as rhyme. Why do we like saucy meatballs? 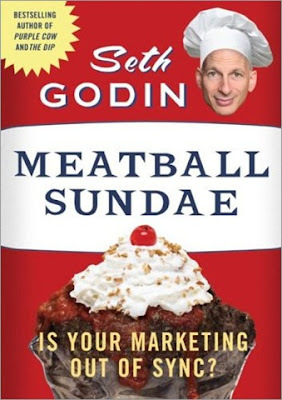 Why do we need sauce with meatballs? What makes meatball sauce so saucy? All of these are penetrating, deep questions with no easy answer. Meatball historians have been plagued by these ontological questions since the first meatball showed up on the scene thousands of years ago. Italians will claim the meatball. Americans claim the meatball. Even the Afghanis have a meatball claim. But who is first? Was the meatball created, or has it always existed a priori to our human existence? Do we shape the meatball, or has it shaped us? This brings us to another interesting subject. Meatball worship. There are cultures in the Pacific islands that believe in an omniscient, omnipresent, omnibus meatball. It is the giver and taker of life. Where the Japanese have the earth or the moon on the back of a sea turtle, these islanders have it all within the deliciously well-seasoned layers of the tropical meatball. The belief is that all life is saucy, delicious, and full of meat. We must embrace it, smother it with sauce, and devour it. 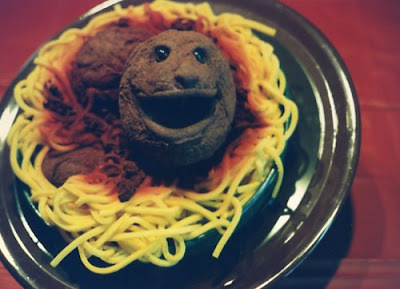 Then the meatball has become one with us and we have become one with it. But what makes a meatball? Is it the meat, or the spherical shape? Is it the sauce, or the spices? 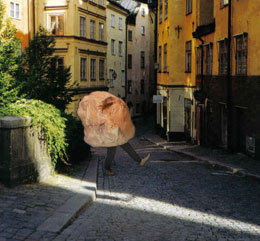 The meatball is whole. It is not just its parts. It cannot be entirely meat or entirely ball, just as we cannot be entirely "hu" or entirely "man". If we understand the meatball, we in turn understand ourselves. All meatballs made by man worldwide are symbolic of this greater metaphysical truth meatball. Some are made out of goat, sheep, beef, turkey, or, in some rare cases, people. But regardless of their meat substance they have a unity of shape and purpose. Roundness and edibility. Such is life. Round and edible. Turns out yesterday this blog was on crack. Not too uncommon on April fool's day I suppose. There were a lot of new readers. 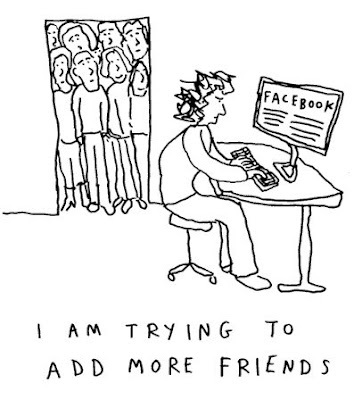 Well, I still have 996 facebook friends so no one made any money. Sorry (But not really, so I retract that apology). However, I would like to tell you that Wells County Nevada will soon be a little richer on my account. I'm not going to elaborate. I'm just going to say I am not a fan of pigs. Let me tell you a story. This happened a little more than 3 years ago. It might sound like fiction, but I assure you, it is most unfortunately not. I had a bad week. That's putting it lightly. I had broken off an engagement, tried to get my money back with the ring (successfully, but not without stepping on some toes), got a concussion iceskating, and was accused of stalking by mall security because I was in and out of the jewelry store so much. So I had it with Provo. On Sunday I just got in my car after church and started driving south. After I made it to about Cedar City I called my grandmother in Pasadena and said, "I just need to get out of here to cool off. Can I stay with you for the week?" Thankfully she obliged. 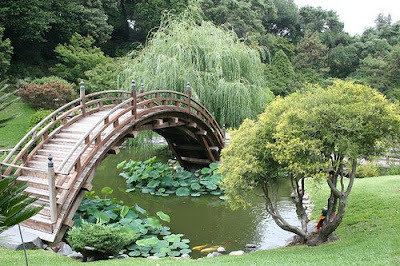 We went to the Huntington Gardens, talked politics, strolled around the beautiful suburban LA scene, and had a jolly time. It was a much needed break. But I was not that far away from Murphy's law and the age old adage that says, "When it rains it pours." I couldn't just cover up all my baggage with a brief SoCal vacation. So I decided to take highway 50 across Nevada to get back home. For the record, most of northern Nevada is open, flat, lifeless desert. 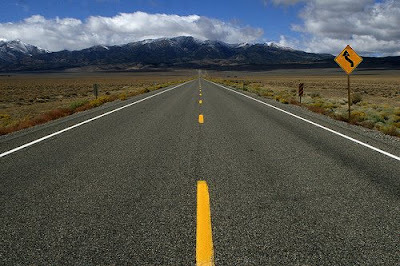 And, route 50 is probably one of the least traveled, most boring highways in America. So, I decided to make my trip as quick as possible (clearly a bad idea). I set the cruise control a 100mph. Well that was well and good until I saw the unmistakable outline of a cop cruiser coming towards me from the other direction. I knew it was going to turn around and follow me, but by the time he turned his lights on in pursuit he was about 2 miles behind me given my velocity. So, I reasoned with myself that he was probably chasing a jackrabbit or someone else, or that he'd stop after he realized how far behind he was. Bad move. All the while I was listening to Dishwalla (the Opaline CD on my iPod-product placement plug in the story). Well, after about 20 minutes I decided I'd humor him and pull over. Pulling over was the right thing to do, but my next move was stupid. Not thinking very clearly I got out of the car. At the time I was wearing khaki pants, a black polo shirt and was barefoot. 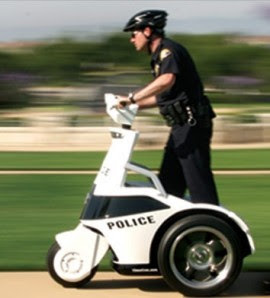 So immediately the cop is thinking, "DRUG LORD!" And the first things that came out of his mouth weren't pretty. They were along the lines of "F- you, I'm gonna shoot you! You f-ing stupid bleep! I hate your grandma and the jews! Blah blah blah, ethnic slur... you gypped me, yada, yada" It was the typical brash cop intimidation tactics. But I was pretty stoic and unphased, which probably pissed him off more. Then he said, "You put my your life and my life in danger," to which I thought, "No. You were the one who decided to chase me. You put your own life in danger. When you chase danger, danger gets you." But, fortunately for me I kept my mouth shut. Then another cruiser rolled up. His partner tells me he was going to get a spike strip to stop me. Right. A honda civic with 218,000 miles on it, and a slightly refurbished engine going a touch over 100mph, and you were going to get a spike strip? So they cuffed me and threw me into the back of the cruiser. As I sat there they both had their guns still cocked and ready, pointing at the trunk of my car as if some little midget was in there ready to jump out with a Tommy gun when they opened it. Then they opened it and found my wetsuit and a scrabble board. Total shocker. The kid eagle scout and former LDS missionary who goes to BYU and just came back from visiting his grandmother doesn't have any drugs or fully armed midgets in his trunk. Just wetsuits and scrabble boards. Maybe they thought I stashed the drugs inside the little scrabble hourglass timer. Who knows. So they took me down to the precinct and had my car towed. Once we got to the station he stopped lecturing me and took my finger prints and mug shot. Bail was set at 1264 dollars. He asked me if I wanted to pay it and leave or stay the night. So I stayed. But, before I could put on their oh so fine neon orange and white pinstripe jumpsuit I had to give them my clothes and shower. The shower was like a little squirt gun. The soap was as big as my fingernail. So I did the best I could as he watched. Then I got some cute matching neon orange boat shoes and dressed. It wasn't too bad. I could watch March Madness from just outside my cell in the common room, and was in there with only one other guy named Jimenez or something. Apparently he was drunk and had committed some domestic abuse. But, by law I was permitted two hot meals and a third one cold. Carl, a good inmate apparently, was the chef/cart pusher and he would bring the food and books. Things were looking on the up and up. I managed to get a hold of a couple lawyers and friend and my dad and got the bail covered. But, before I left they had me arraigned. My ankles were shackled and my arms were cuffed as they put me in the back of a police SUV. Then they drove me one block over to the court house. After standing up and sitting down a couple times and getting handed a huge stack of paper with a line on the end with two boxes, one that said guilty, the other innocent, I checked the innocent box. Then they took me back to the jail, gave me my clothes and said I was free to go. But, I didn't have my car. So I asked, "Where is my car?" to which the lady at the desk said, "Oh, it was towed to Ely." Now I was in Eureka. I asked her how far away Ely was and she said an hour and a half east. So I then asked if I could get a ride over there to which she said, "Well if you wait 5-7 hours we could get one of the boys to take you after his shift or you could figure something out," to which I replied, "I'll just figure something out." "So I'm looking for my car." "What's it look like?" he said, with a thick western drawl. "It's a blue honda civic." "Well I jest got me one of them last night." "Great. So where is your lot?" "Where are you at? I kin come over and pick you up." "Oh, the shell gas station." How nice. Service with a smile and a pick up. I looked out the window and saw a beat up old white pickup truck and knew it was him. I hopped in and we started shooting the breeze. He was a nice guy, and took a liking to me. He said, "I like you so I'm only going to charge you 20 dollars for the lot fee. Usually it's 60." I was thinking, "Wow. Thanks. Maybe this won't turn out to be so expensive after all." Well that dream was shattered. When I came back to settle the bill he charged me 435 dollars and handed me the affidavit so I could make sure everything was still in the car. Turns out I was missing the most important thing. My wallet. I scrounged around but couldn't find it. So I paid him with my card number from memory. Then I asked him if I could use his phone. I knew where my wallet was. I called Eureka county jail and the desk lady answered the phone. I said, "Hey this is Michael....yes I was your guest last night...is my wallet there?" She said, "Sure is, I have it in a nice manilla envelope right here." Then I asked, "Is there any possibility someone might be able to bring it out to Ely," to which I got the pat reply, "Well maybe in the next 5-7 hours when someone gets off their shift." So I went back to the jail, driving without my wallet to get my wallet and get the heck out of Nevada. And I did. But only after having visited Eureka twice, Ely twice, and having paid to run the entire town of Eureka for a month. I later settled with the court and got the evading charge removed after a year of good behavior, but settled for the speeding charge. The lawyer cost me a grand. So the total cost of my indiscretion was about 3000 dollars. And that's the story of how I got thrown in jail. I wish it was an April fool's joke. As of this moment I have 996 facebook "friends". So, I have decided to create a new game to encourage more meaningless online social networking interaction with people I hardly know. If I get 1000 friends today (that means four more for you math majors), one lucky friend will get one thousand dollars and my personal recognition of their existence and my congratulations for being my online friend on their wall. Should be exciting. If you're not my friend yet, it seems it might finally become profitable. Good luck facebookers! Now, you may have noticed that I have not written anything for four days, which, while unfortunate, hopefully did not cause any lasting damage to anyone's worldview. I had a good discussion yesterday while driving back from San Francisco to Provo. I cannot say my excuse is that I was having a four day long conversation in the car, but I will say that camping out on California beaches is not particularly conducive to blogging. Our conversation was expansive and we talked about government, the economy, freedom, purpose, and life in general. I wish you were all there. You probably would have learned something. We had some interesting view points from all sides. The two people who led the conversation were me and my friend from Hong Kong (so this was not just a domestic politics discussion, but became international as soon as my friend opened his mouth). Another contributor lives in Utah but was raised in Oregon. So, while not all demographics were equally represented, I think we dug pretty deep when it came to what really matters. But, that being said let me just say something that might shock you. THE GOVERNMENT OWNS YOUR SOUL. Some might find that ridiculously unfounded and over the top. In some ways they would be correct. In other ways perhaps not so much. Nothing is ever as superficial as it seems. Other than the fact that the government has spy planes watching your every move, and puts mind controlling drugs in our water supply, the government is not just about politics. And, even if they were, politics is invasive (Like a root canal that somehow turns into open heart surgery). The government in the US, and in any country for that matter, is supposed to provide some sort of semblance of order and provide basic protections for individuals, families, and groups. But, unfortunately, the government quite often does a fairly shoddy job. Part of this stems from the efficiency-corruption continuum, and part because of how democracy and bureaucracies work. In the efficiency-corruption continuum you have on one side the most efficient form of government, a dictatorship, but with the possibility that it could be entirely corrupt and affect changes that completely annihilate human virtue. On the other side you have a socialized democracy that has so much red tape that it never gets anything done, but does not do so much damage if it is corrupt because there are so many voices and none can do more harm than another. Neither case exists in the US. We have a melange of the two that leans both ways. But here's the catch. You don't have to lean just one way. It's not really a continuum. 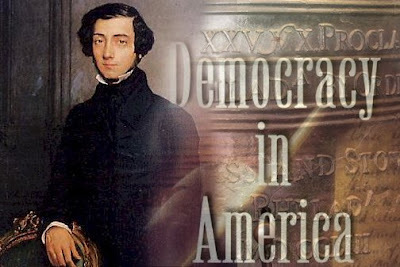 As Alexis de Tocqueville pointed out in his famous book Democracy in America, democracy's greatest tendency is towards centralization, bureaucratization, and consolidation of federal power. This is because in a modern democracy the desire for equality supercedes the desire for freedom. That is because democracy tends to flatten people. Not literally, but spiritually. In a democracy without any aristocratic vestiges like juries, courts, religion, free associations, or high ranking people to look up to, people tend to look in three directions. They look to themselves for guidance, the majority for guidance, or history for guidance. All three lead to the same conclusion. "I am insignificant and I am just a grain of sand awash in an endless sandstorm, therefore I follow the sandstorm." Instead of people finding something substantive to back their desire for equality like human virtue or God, they only want freedom to express an undefined vision of themselves that is defined by history and the majority. It is equality by default. Equality for the sake of equality. "What is good for me is good for me, but not necessarily good for you, and we can both be equal because no one's opinion matters more than anyone else's - they're all good!" It is simple relativism. So what is the solution? How can we prevent people who, in their weakened self-deluding state, give the government more power over their lives because they want equality at all costs? How can people find meaning and purpose in their lives? Well, there is no simple equation. There is no all-encompassing theory. And guess what? That's okay. In a general sense we can see a need for aristocratic freedom. Rights have value because we are all human and there is something transcendentally good within us, whether you believe it comes from God or elsewhere. We need to believe in a foundation. And, we should all get involved, form groups, associations, coalitions, and provide some vertical lumpiness to our otherwise flat and unguided democracy. We need lawyers, judges, juries, newspapers, federalism, God, and upstanding strong-willed and morally ethical citizens to look up to. We need to believe that there is value in tradition and in the past while looking open to the future. However, we cannot sacrifice meaningful freedom and equality with the mantra of "change" or "progress" for the sake of progress and change. There must be purpose. This is an analogy that should help it all settle a little better for you. Let's suppose you have a house. But the house has no walls, no doors, no windows, no roof, no yard, but is just a vacant lot. To have freedom in that home is meaningless. What are you free to do? You are free to be free, but without any stairs, chairs, or doors, there are no real possibilities of exercising freedom. So, your house must have furniture, rooms, walls, windows, and maybe even a nice garden. With substance you have real freedom. With substance you have real equality. Without it you have relativism.